I made many, many fashion faux pas, but this is probably one of my worst..
Years ago, just before the millenium, I was staying in Paris during fashion week and after a day of running around, I went to diner with some friends. We had booked a table in a little ‘in-crowd’ restaurant and were talking about our favorite designer those days, Helmut Lang. One of the boys was wearing a shirt by Helmut Lang, another a pair of briefs and I, very low on cash at the time, was wearing a cardigan I made myself, but it was a bit too much inspired by Helmut Lang….. I had a great evening, until…the others started giggeling. I didn’t understand what was going on, till they asked me to turn around. 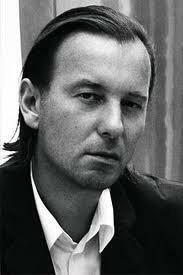 There he was, Helmut Lang, together with some of his models at the centre table of the restaurant. I turned purple and just wanted to dissolve into dust. I tried to take of my cardigan, as unnoticeable as possible. He didn’t see what was happening at our table, but I felt bad anyway. Sorry, mr.Lang!!! !